World Report: "Anti-cyanide protestors in Sofia boosted by European parliament support," CEE Bankwatch Network, January 20, 2009. 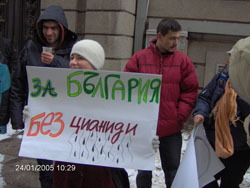 "Anti-cyanide protestors in Sofia boosted by European parliament support," CEE Bankwatch Network, January 20, 2009. Residents of the Bulgarian village of Poibrene have today taken their long-standing concerns about the potential introduction of controversial cyanide technology at the Chelopech gold mine – led by Canadian firm Dundee Precious Metals – directly to the Bulgarian ministries of environment and health and to the Sofia office of the European Bank for Reconstruction and Development (EBRD), the publicly-owned development bank that is a potential funder of a USD 150 million project that could see cyanide leaching introduced at the gold mine without inclusive public consultation. "...this is a potential move that is relevant to two million people living downstream of the mine along the River Maritsa, Bulgaria's biggest river." In spite of close to 15,000 signatures submitted in September 2008 to the Petition Committee at the Bulgarian parliament against the introduction of cyanide at the Chelopech mine, to date no response from the responsible ministries has been received. A separate court case brought by – among others – the mayor of Poibrene against the current Chelopech environmental impact assessment has also raised the issue of insufficient public consultations.